Earlier this summer, our theater company—Baktun 12—presented eight shows to audiences of 130 to 160 people. We even had to turn guests away. This is a not a small thing on the east side of Salinas, the Alisal. 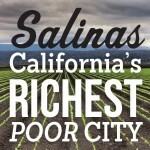 The community is known for an undocumented population that sustains an $8.1 billion agricultural industry, for contributing to Salinas’ ranking as the second-least-educated city in the country, and most noticeably, for its gang violence—but not for sold-out theater. I didn’t see much theater growing up in Alisal. First, there was The Nutcracker in what must have been the fourth grade at Alisal Elementary School. My only memory of that performance is the fun my classmates and I had with the name of the production. It wasn’t until my sophomore year in high school, when I attended two plays at a theater festival at the local community college, that I realized how powerful this art form could be. The first, a play about World War II and the greatest generation called Studs Terkel’s The Good War, really sold me on the idea that there was such a thing as a “good war.” Then the second, Marat/Sade, just pissed all over the first play, injecting seeds of subversion into my fragile young mind. It successfully introduced me to the idea of revolution as class warfare. The characters—inmates of an insane asylum—were nothing like the colonists of the American Revolution I’d learned about in school. I decided that I was talented enough to carve a niche for myself as an actor. But then, in the latter half of my senior year at Alisal High, depression set in. We were entering the ’90s and the reality that my dark-skinned self could make a career out of acting suddenly set in. 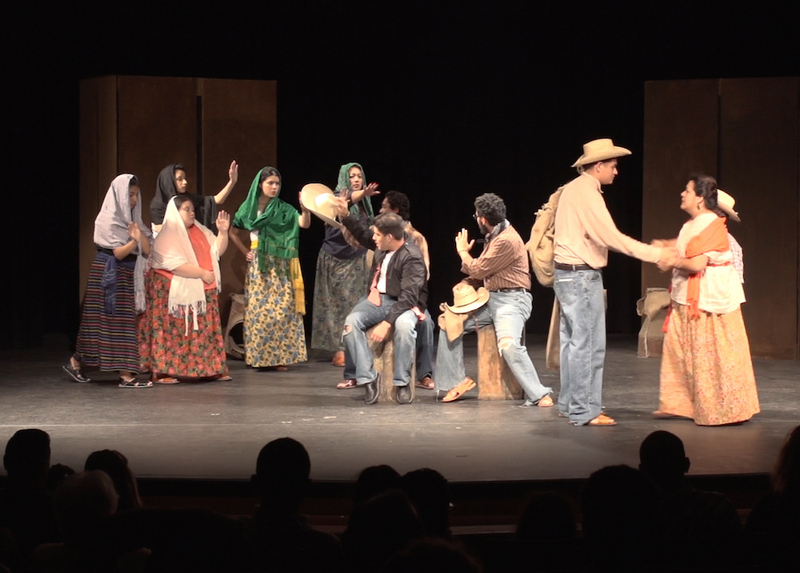 Cue the world-famous Chicano theater company, El Teatro Campesino, located in San Juan Bautista, about a half hour north of Salinas, which awarded me a scholarship to attend their summer theater camp. Luis Valdez founded El Teatro Campesino in 1965 after joining labor leader Cesar Chavez and the United Farm Workers to give voice to the voiceless men, women, and children picking the fruits and vegetables of American markets. El Teatro Campesino gave me a voice, too. I spoke little Spanish at the time, but I didn’t let that stop me, embracing my pochismo (the slang term for being a U.S.-born Mexican with substandard linguistic and cultural awareness), and eventually learning and practicing my parents’ language. I also discovered that my neighborhood, my friends, and my family could be my audience. Throughout the 1990s in Salinas, I presented in everything from a one-man show for local elementary school kids inspired by Mayan mathematics to an East Salinas version of the Dickens classic called A Christmas Carol ¡Y Que¡ As part of a hip-hop theater troupe that eventually grew into Baktun 12, we made a name for ourselves by taking a psycho-political approach to Chicano theater. In the early 2000s, I focused my energy mostly on developing theater for Bay Area audiences as part of a trio. Years later, I decided to return to Salinas, to work again on theater for my community, the friends I grew up with, and my immediate family—the people who have always been my target audience. We put an ad in the paper asking people to tell us their stories. Then we used those stories to create the play reAlisal: Your Neighbor’s Story, which we performed in 2011 for up to 2,500 audience members in and around our hood. I discovered the impact my neighbors had on the world inside and outside the east side of Salinas. Our second production came about three years later with reAlisal: Stories de Acosta Plaza. Acosta Plaza is a neighborhood of low-income townhouses in the Alisal that, within a span of 13 years, was featured over 250 times in the local media. Of those 250 mentions, only 10 had something positive to report. The rest were stories of gang-related violence. Nobody knew of the stories beyond those ambulance-chasing headlines—the champion athletes and academics who brought pride to their neighbors, the community-organizing mothers and fathers who fought for better representation, or the love that helped everyone survive the economic downturns of factory layoffs and predatory lending. Stories de Acosta Plaza brought these oral histories of our community to life. For our most recent production, Mi Abuelito Fue Bracero, (My Grandfather Was a Farmworker), we decided to explore the roots of our Mexican-American farmworker community. My father, who came to the U.S. to work in the fields in the middle of the 20th century, had never shared with me any of the challenges of being a young man on his own in a different country. This was a chance for me, and the rest of our audience—many of whom have fathers, grandfathers, or great-grandfathers who also came here for the agricultural industry—to get to know our past. 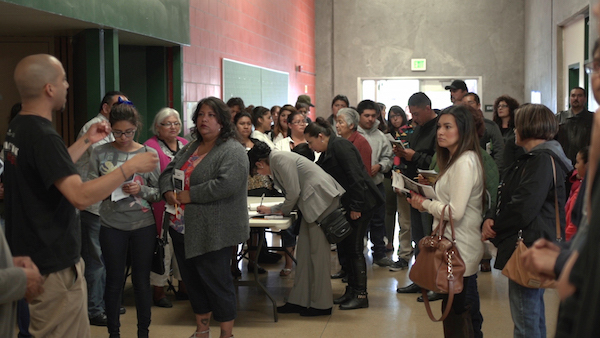 We videotaped community members talking about their lives as braceros. Those interviews then inspired a script that was performed by actors—community members who range in age from 11 to 43. The story inspired several actors to research their own histories in turn, and to piece together some of the mysteries behind their family relationships. Mi Abuelito Fue Bracero tells the story of a mother trying to teach her 25-year-old son about their family history in the present. 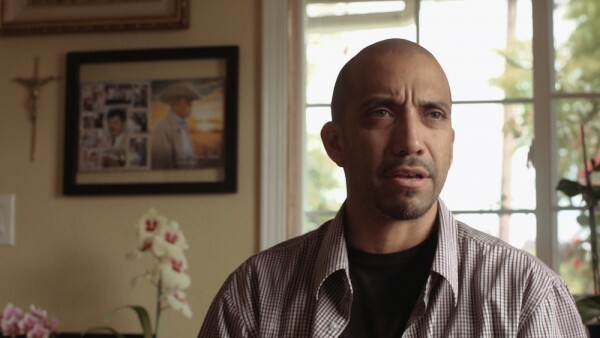 Their struggle to build a future when their past is marked by violence is juxtaposed with the story of her father and his grandfather, a bracero who was killed in a tragic accident that took the lives of 32 of these workers in 1963. Our goal with Baktun 12 is to tell as many of our neighbors’ stories as possible. If we can get our community to come see theater and to see themselves, maybe then we’ll find out more about our lives, our mysteries, our power. ¡Que viva el teatro! Luis Xago Juarez began his theater career with El Teatro Campesino and has since worked with Baktun 12 in East Salinas, Teatro Visión in San Jose, and headRush in Oakland. This essay is part of Salinas: California's Richest Poor City, a special project of Zócalo Public Square and The California Wellness Foundation. *Photos courtesy of Luis Xago Juarez and Eric Gutierrez.